What Does 1 Samuel 24:4 Mean? 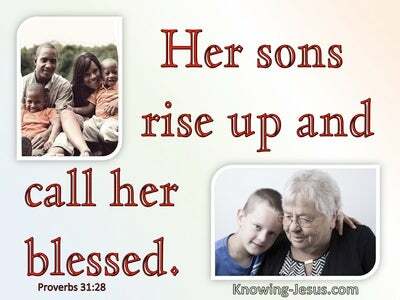 Samuel the prophet was raised up by God to bring the time of the judges to a close, because Israel lusted after a king. 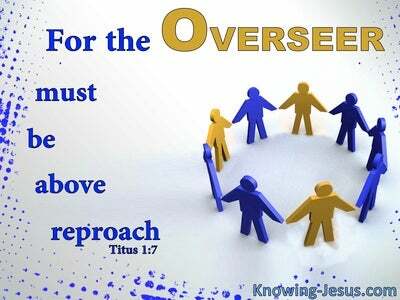 They rejected the Lord as their sovereign ruler, because they wanted to be like their gentile neighbours. It was a time in Israel's history when everyone did what was right in their own eyes.. and God gave them over to their evil desires. 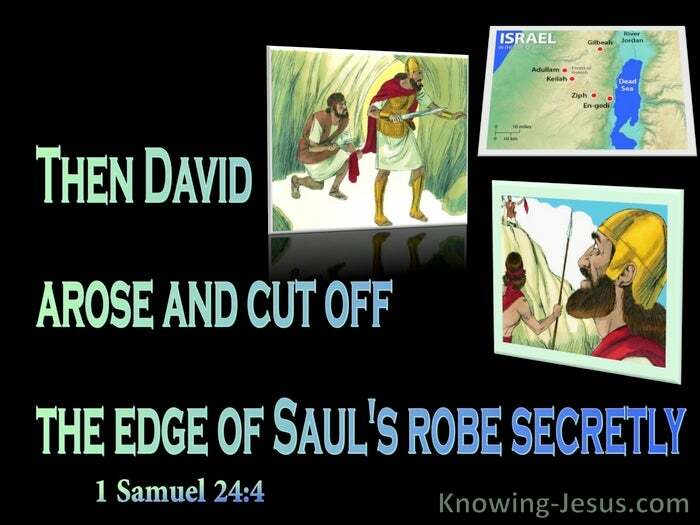 Saul was anointed as Israel's first king by Samuel, but he quickly became proud and disobedient. His rebellious nature caused God to choose another man to succeed him. God knew that David, the shepherd-boy from Bethlehem, was a man after His own heart, and so Samuel was sent to anoint the youngest son of Jesse, in Saul's place. God blessed David, who became a mighty warrior, making king Saul jealous and resentful.. and so this disgruntled man spent the last years of his life hunting David in the hills and caves of Judea, in order to kill him, and remove this threat to his kingly succession. Saul in his angry, jealous pride, was foolishly resisting the will of God. And so it was, as Saul pursued David with 3000 fighting men, into the wilderness of Engedi, he rested a while in the very cavern, in which David, himself was hiding! 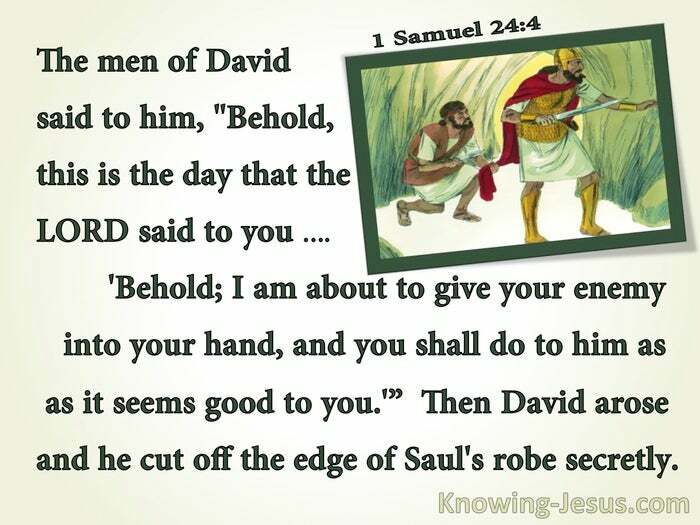 Encouraged by his own loyal servants, David crept over to the sleeping king and secretly cut off the edge of his robe, before Saul awoke. His men had urged their king-in-waiting, to slaughter the sleeping Saul, who was determined to kill David and his followers: Behold, this is the day of which the LORD said to you, 'Behold; I am about to give your enemy into your hand,, and you shall do to him as it seems good to you. Although he was the rightful heir to the throne, David, had received no instruction from the Lord to destroy his enemy, and could not bring himself to harm God's anointed king. Nevertheless, he quietly arose, crept up to his enemy's side, cut off the edge of Saul's robe secretly - and then silently left the cave, demonstrating that his heart was right before the Lord.. and acting wisely, by not taking the matter of his succession to the throne of Israel, into His own hands. Immediately after this encounter, his conscience smote David.. and although it caused Saul to tearfully acknowledge that his own vindictive, hatred for David was unjust, and that the actions of the future king demonstrated kindness and righteousness, Saul's change of heart was short-lived. However, throughout the entire episode, David honoured the Lord in his actions and attitude, and no doubt he learned a valuable lesson, which was to abide by God's timing.. and to act justly and show mercy to his bitterest enemies. David learnt the importance of allowing the Lord to fight his battles and to guide his steps. Although this little piece of Israel's history, is interesting to us, it does not hold any real significance to the body of Christ in this church dispensation, and yet there are lessons that we can learn from this interesting snippet of Israel's history. Saul painted a picture of a proud man, who allowed his fleshly emotions to rule his life, and permitted hatred to fester within his heart, while David demonstrated a man whose heart was right before the Lord. David was a man after God's own heart, who remained humble before the Lord and desired to honour His name. 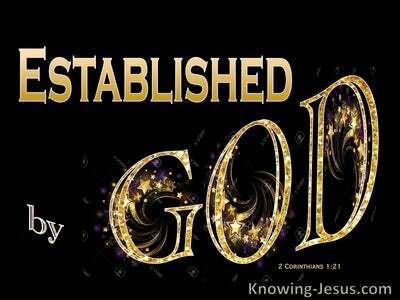 He hearkened readily to his inner conscience and maintained a trust in God's timing, even when he was encouraged to circumnavigate the plans and purpose of God. David showed respect to authority figures and those in positions of responsibility, and demonstrated deep devotion to God, a desire to do His will and a reverence for His holy name, which is rare and very beautiful. 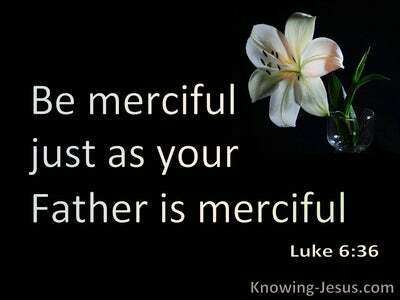 May we learn from this great patriarch, and seek to be men and women after God's own heart, despite the difficulties and dangers we will encounter.. and may it be our hearts desire to walk humbly and trustingly before Him, all the days of our lives.